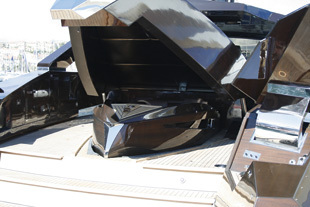 At the 2010 Cannes Boat Show an incredible new boat from Serbian yard Art of Kinetic, called the Hedonist, rocked the pontoons – and now there’s an open version. The Art of Kinetic Hedonist Open uses the same machinery and build techniques as the original boat except it’s had the roof lopped off. In its place are a pair of stunning, stainless steel buttresses and a purposeful, forward-facing radar arch. The lay-up of the Open is the same as the original boat which means a mix of mahogany and Kevlar for strength and lightness whilst the topsides are sealed with seven layers of clear epoxy resin followed by 15 coats of varnish. Power comes from triple 800hp MANs on jet drives so this 62ft 4in (19.00m) wooden wonder should do 40 knots flat out. If the big boat doesn’t quite cut the mustard in terms of thrill factor then the miniature replica jet-tender, capable of 50 knots, should do the job. The first Open will be ready in the summer.